About a dozen of the Delaware Nature Society’s Advanced Naturalist Club and Naturalist Certification Series recently spent an unusual but enjoyable Thursday night standing up to our waists in a swamp in rural Delaware! We were on the Herpetology field trip of the Naturalists’ Certification Series, a popular program run by the Nature Society in which various experts give an indoor lecture on the biology and identification of such diverse organisms as birds, mammals, insects, trees and wildflowers. The lecture is followed by a field trip a few days later to allow us to put into practice what we learned. Jim White, our Herpetology instructor whetted our appetites with a fascinating lecture about the surprisingly large number of species of amphibians and reptiles likely to be encountered around the Delmarva peninsula, and then one evening in July we found ourselves standing on the edge of a swamp deep in Blackbird State Forest. Luckily we had been blessed with perfect weather. The air was warm and the water was pleasantly cool as one by one we bravely stepped into the swamp and started off our search by dragging a large vertical net slowly through the water. This caught a variety of aquatic arthropods and also a few Green Frog tadpoles which proved quite a challenge to hold! Our group wades into the vernal pool at Blackbird State Forest at night. 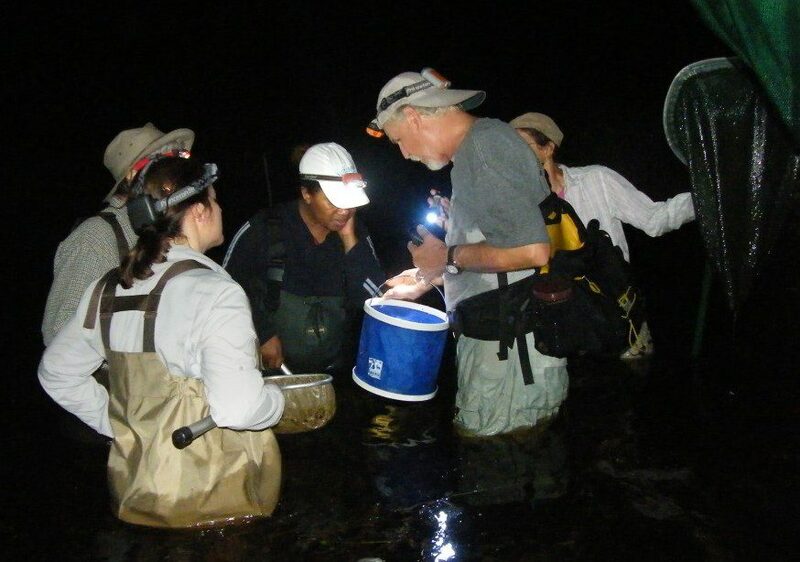 We then split into smaller groups and plunged into deeper water, sweeping our flashlights and headlights back and forth through the vegetation to spot amphibians hidden among the leaves and reeds. Our first catch of the night was a Cricket Frog, a small, neatly patterned frog which gets its name because its constant, high pitched trilling call sounds like a household cricket. Northern Cricket Frog. Image by Ian Stewart. 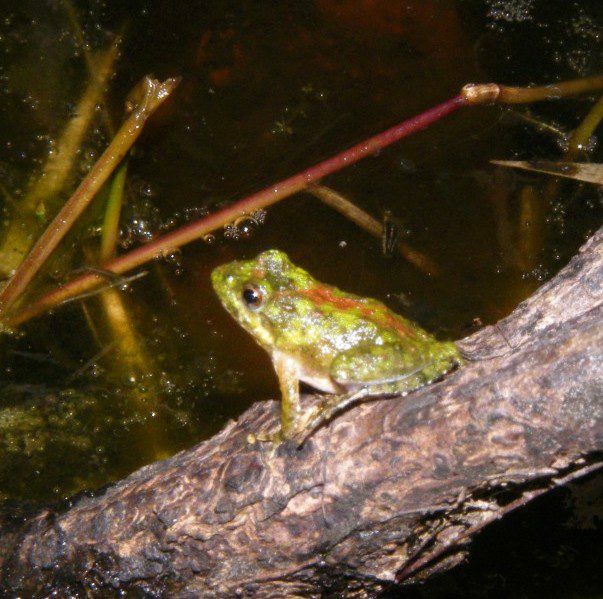 By now we had started to get the hang of wading through deep water while holding a net in one hand and a flashlight in the other and soon one of our group skillfully netted a Barking Treefrog. 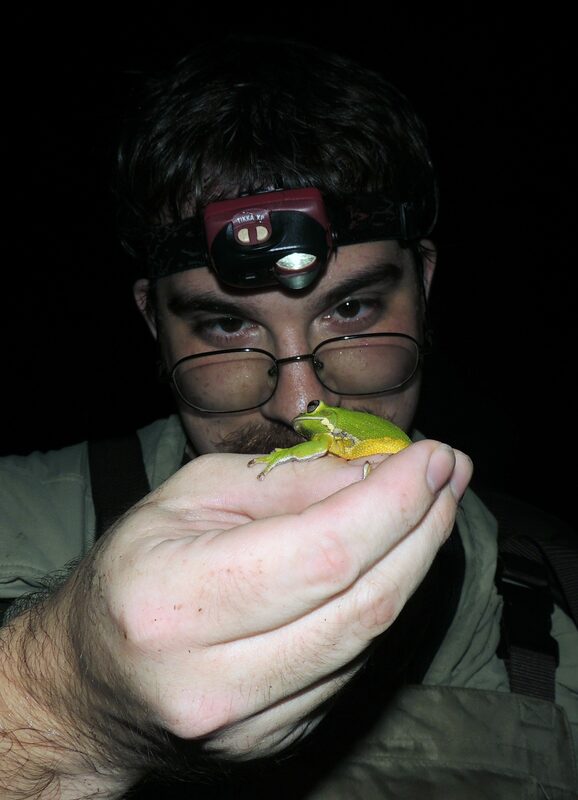 This is a striking, lime-green frog whose dog-like croaks could be heard all around us, although finding the source of the croaks proved much more challenging! This species is a Delaware endangered species, so it was a rare sound indeed. 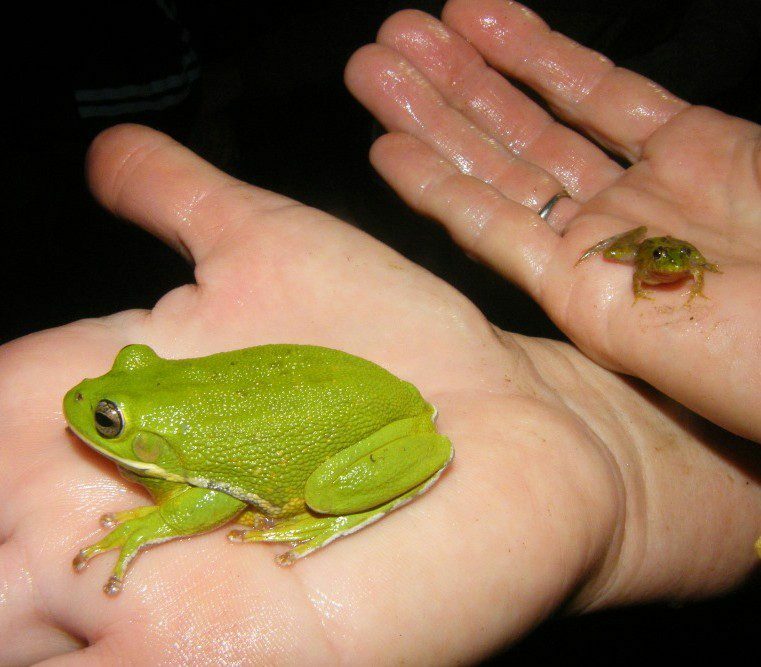 Barking Treefrog and Northern Cricket Frog. Image by Ian Stewart. A shout of excitement then went up as someone spotted a large Bullfrog submerged among a raft of grass. Incredibly, Jim was able to creep slowly up to the frog and then in one swift movement grab it with his bare hands! He then showed us the correct way to hold frogs so that they can’t escape but also don’t get hurt. 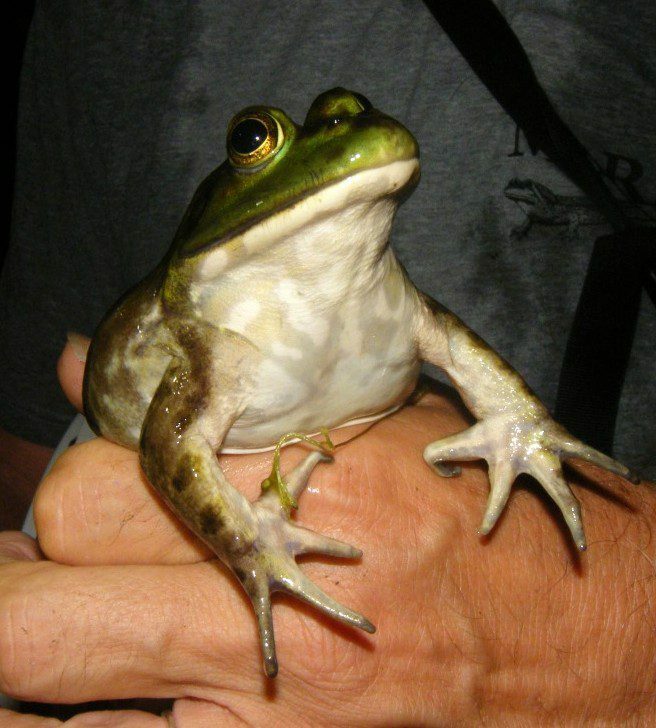 The Bullfrog was a beautiful specimen and everyone got great looks at its huge eyes and webbed feet. A Bullfrog showing the correct way to hold one. Image by Ian Stewart. Just as we were about to leave, Becky Meister and I came across a small snake patterned with light and dark brown bands. We were unable to capture it as it slithered around in some dense vegetation but we were able to get a sufficiently decent photograph of its body that Jim was able to identify it as a Common Water Snake. We then photographed a small, dark green frog covered in large black spots which Jim later identified as a Southern Leopard Frog, a new one for the evening. This frog gets its name from the large black dots on its back and must have been a young one as it still had a tail stub left over from its days as a tadpole. A close-up look at a Barking Treefrog. Image by Jim White. 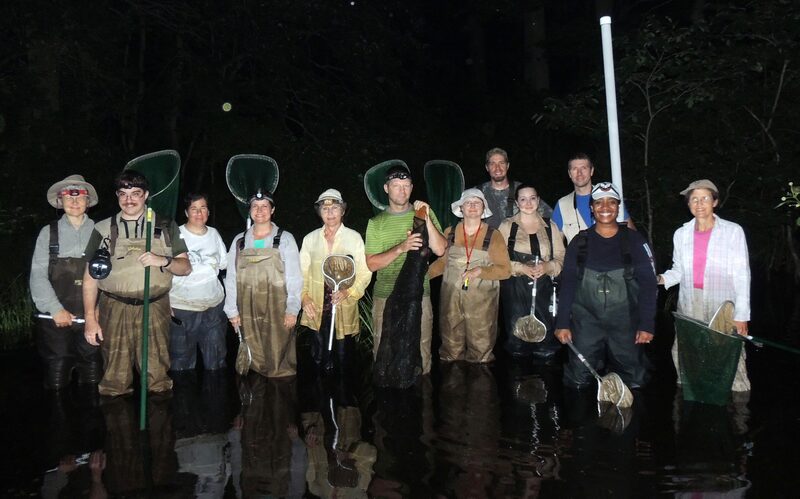 After posing for a group photograph we paused to savor the experience of standing in a swamp in the middle of nowhere, lit only by the silvery full moon while countless numbers of frogs called incessantly around us. It was the perfect ending to a memorable evening! Here we are after our night of herping! Image by Jim White. Great pictures and review of a memorable field trip. Thanks, Ian!